On July 14 KHS VicePresident Nancy Frueh presented a tribute to Women's Suffrage. 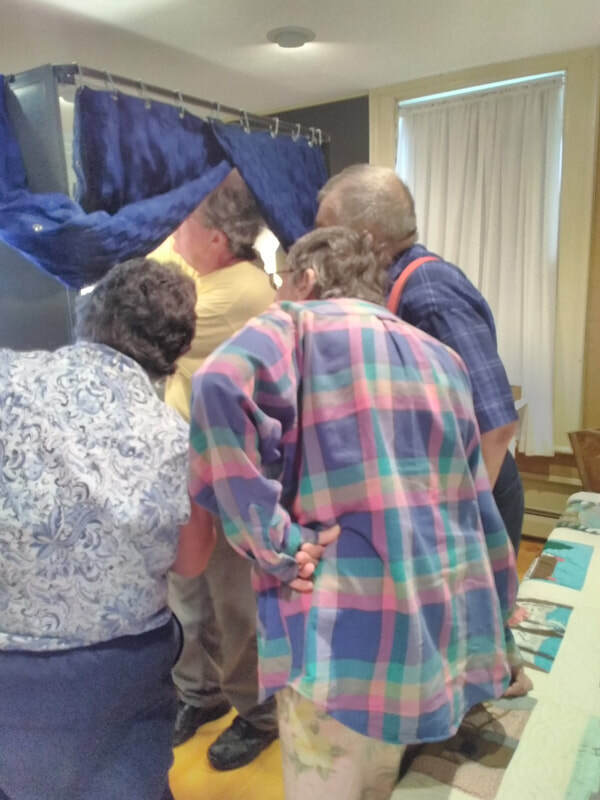 Included in the program was the history of voting and the display of a lever voting machine. Most likely it was in the year 1920 that women in Knox were actually able to vote for the first time. Nancy recounted stories of women's voting in Knox. Nancy displayed a paper ballot that was used in the Knox election of 1907. 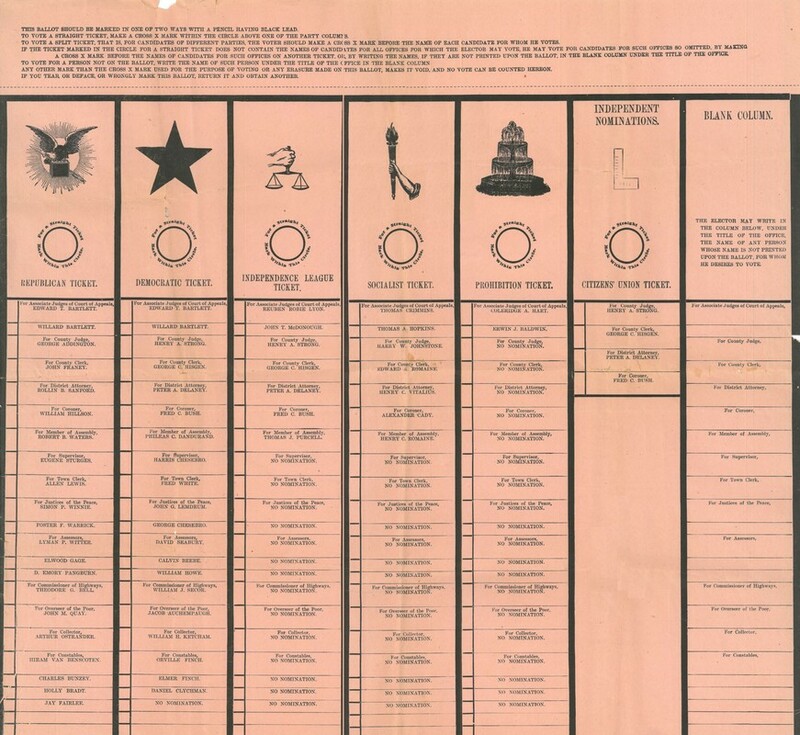 Each voter recorded his/her vote on this "Blanket Ballot", a sheet of paper measuring approximately 15"x15". All offices and candidates for that office were listed in columns under the party symbol. If the voter voted a straight party line, the manual counting of votes would not have been too onerous a task. However if the voter chose candidates for offices from a variety of political parties, the manual count must have been a daunting task for election officials. In 1937 Knox installed 1 or 2 lever voting machines. Eventually the town had a total of 4 lever voting machines. This method of voting was the norm throughout most of the USA until 2008 when optical scanning voting machines were introduced. 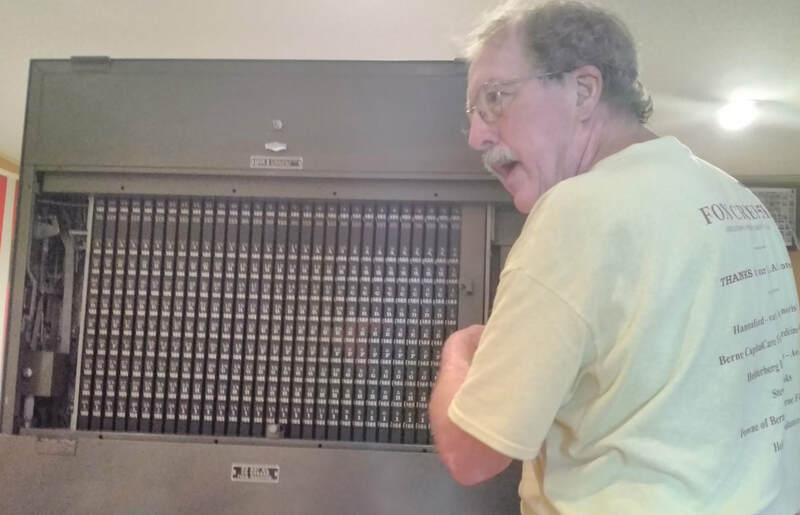 The late Dan Driscoll suggested that the Knox Historical Society keep a lever voting machine in the Saddlemire Homestead to preserve this part of our voting history. Voting Machine Custodians were charged with the task of preparing the lever voting machines for each primary and main election. There had to be 2 Custodians, one from the Republican Party and one from the Democratic Party. For many years Russ Pokorny (pictured above) worked with Miner Stevens as Voting Machine Custodians. When Miner retired from the job of Custodian, Dan Driscoll became a Custodian. ​Russ shared his expertise on the intricacies involved in setting up the machines, counting the votes, and certifying the votes. On the back of the voting machine, Russ points out the sets of counters, 3 digits apiece, for each candidate or referendum issue. Since each counter could only tally 999 votes, election districts were sized to accommodate the maximum number of votes. The Town of Knox had 2 districts for many years to accommodate this. For many years each district had 2 machines. Town of Knox District 1 voted in the basement of the old Town Hall. District 2 voted in the meeting room of the firehouse. These heavy voting machines were stored in the Town Hall basement and it was quite a job to move the machines up the stairs and over to the firehouse. On some occasions a front end loader was used to facilitate the move. Note the circular pins on some of the levers. Levers are locked into place with grouping pins so that there cannot be over-voting. Paper rolls that recorded write-in votes and names of election inspectors who verified the accuracy of the votes. A slide in the front of the voting machine could be lifted and the voter could record a write-in vote. Curtain that ensured a secret ballot. When a voter entered the booth, he/she pulled a large lever that closed the curtain to insure a secret ballot. After casting their vote, the lever was pulled and this action increased the counters corresponding to the votes cast and reset the voting levers to their neutral position. KHS President Dennis Barber . A Pollworker would stand at the side of the lever voting machine and would press a button after a voter left the voting booth. Russ said that the lever voting machines in Knox worked very well, although it was a time consuming job for the Voting Machine Custodians to set up the machines. Russ said one disadvantage of the lever machines was the lack of a paper trail. Today's system of the optical scan voting machines does provide a paper trail.